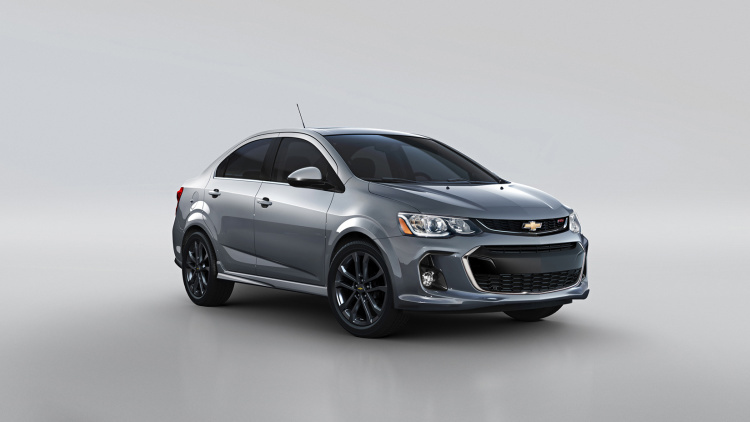 Chevrolet is bringing an updated Sonic to the 2016 New York Auto Show, and in the process of facelifting the new hatchback, we’re worried the new look loses some of the character from one of the sub-compact segment’s most charming entries. Naturally, we’ll wait until we see the car on the floor of the Javits Center before making our final judgment, but it’s fair to say we’re not blown away by this update. The new look ditches the four inset headlights that gave the Sonic such a memorable face, and goes with what could best be described as a Camaro-inspired look (we know it sounds crazy, but check out the face of the Camaro and compare it with the image above). The single-unit headlights and their LED running lamps are attached to the latest version of Chevrolet’s grille. The upper grille is slim and wide, and the lower could be called gaping. In back, Chevy has retained some flashy taillights, but has again gone with a single-unit design, rather than the inset shapes with the black surrounds found on the old car. The hatchback model will now be limited to the RS trim level. There will be two versions here – the RS LT and RS Premier – while the sedan will be offered in LS, LT, Premier, and RS. Like the current car, there will be 15-, 16-, and 17-inch wheel options, although based on the RS shown above, even the largest wheel option looks underwhelming, especially compared to the current Sonic RS. There are some positive new additions, of course. There’s a new seven-inch MyLink-equipped touchscreen display (which is compatible with both Apple CarPlay and Android Auto), heated seats and a heated steering wheel, keyless opening and a push-button start, and a segment-first power driver’s seat. Chevy hasn’t been quite as progressive under the hood, where the standard 1.8-liter four-cylinder and 1.4-liter turbocharged four-cylinder remain unchanged. Two- and three-pedal six-speed transmissions will continue to be offered. We’ll have more on the new Sonic when it makes its debut next week at the New York show.